Photo courtesy of Waltham Forest London Borough of Culture 2019. 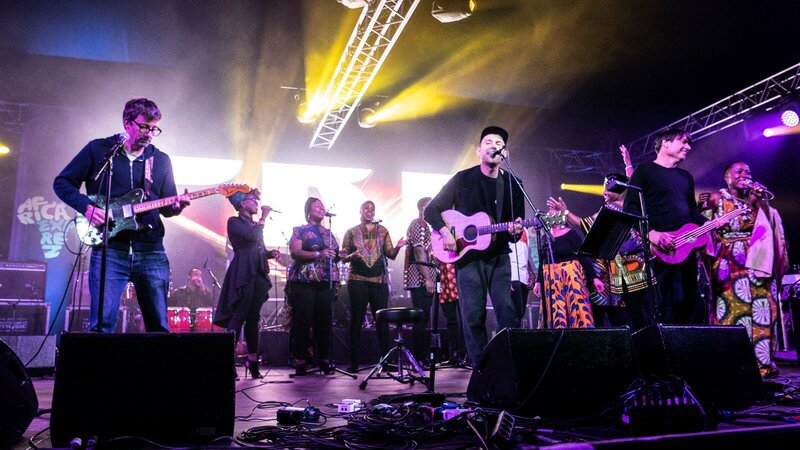 Blur made a suprise live appearance yesterday (March 29) at Africa Express: The Circus in Leytonstone, London. The band played three songs: "Clover Over Dover", "Tender" and "Song 2". For "Tender", they were joined by Rokia Traoré and the London Community Gospel Choir. Forum member themanwholefthimself points out that "Clover Over Dover" was performed live for the first time ever. This appearance marks the band's first live performance since 2015's The Magic Whip tour. Earlier in the evening, Dave Rowntree joined Slaves, Paul Simonon, Pauline Black and Nicky Wire to play drums on "Guns Of Brixton". Video clips from the performances can been on BlurMex's Facebook and Twitter. Gorillaz share new song "Hallelujah Money"